The unique guest fingerprint drawing is a great way to artistically capture the memory of your loved ones on your special day. You can hang it in your home together and it will become a cherished keepsake. Our products are unique because they aren't quite finished until your beloved guests make their mark on it at your event. Below are a few tips included to help your guestbook art work turn out as beautiful as possible. 1. Dont leave your fingerprint guestbook unattended! 2. Ask your guests to sign, then stamp. If you are doing a balloon, everything really fits together better if thumbprints go over signatures. Sometimes writing dirctly over a freshly stamped fingerprint can make the signature bleed. Signing then stamping prevents this from possibly happening. 3. Provide wipes for guests. On the big day, we suggest having a white box of baby wipes on hand at the table so that the guest can wipe the ink off right away. We also suggest peeling the sticker off your box of wipes (for aesthetic purposes) and cutting the wipes in half ahead of time to maximize usefulness and minimize waste. Have the guest book attendant give each guest a wipe immediately after stamping so that the ink doesn't have a chance to dry on their finger. Provide a small trash can beside the table or a nice bowl for the guests to toss their dirty wipe away in. 4. Choose your pens and ink wisely. Based on lots of testing and trials in our studio, we have found that dye-based inks work best with fingerprints. 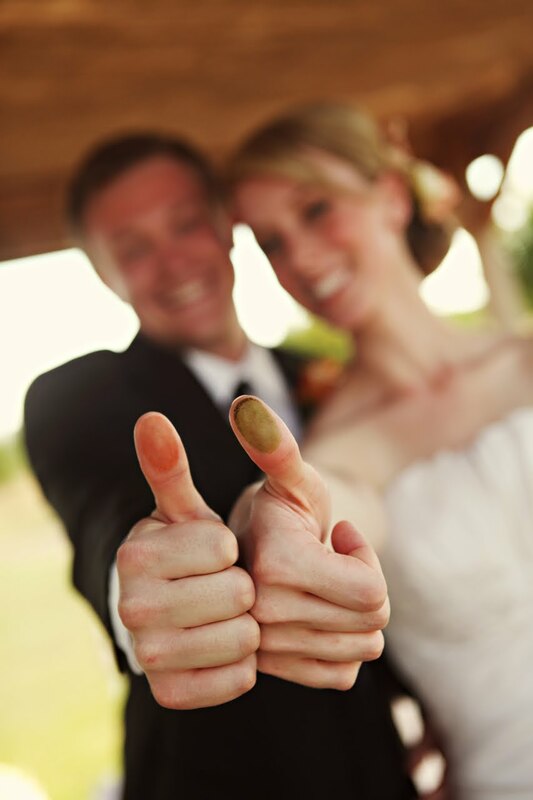 Our inks dry quickly, so you needn't worry about ink getting on guests' clothes. Most of the colors wipe away from hands completely, if removed with a baby wipe immediately after stamping. Please see our full selection in the shop. For your guests to sign over or next to their prints, any archival, fine art or scrapbooking pen will be good. Just don't use regular or fine point sharpies. (They are acid based, not archival and can bleed). We now offer the same pens we use to make our drawings for sale in our store, but you are welcome to pick something up on your own as long as it meets the above specifications. 5. Keep the guest book away from an open bar. Try to get the guest book attendant to get everyone's fingerprints during the first part of the reception, or even before the ceremony. This takes care of things before any guests have the chance to "get creative" with your lovely drawing. The ink on the art posters is also water-based, so you don't want any drinks being set on or near it. It is safest to frame the drawing for your event, but leave the glass or plexiglass at home or behind it: that way, at the event, the exposed paper will lay flat, look polished, have something solid under it, making it less likely to get tattered in transit. This is not a big deal for the little drawings, which you can have framed later. All of our papers are standard frame sizes so that you can easily find a pre-fabricated frame or have it custom framed to taste... the choice is yours. If you have any more questions about administering your fingerprint artwork, feel free to contact us! We are here to help.